Monday, December 19th, 4:30 pm at Cutler Bay Town Hall. This workshop is to discuss the potential agreement between the town and the Miami-Dade County School Board regarding a High School in Cutler Bay. Wondering what to do with the little ones during the Winter Break? Miami-Dade Parks have a list of camps with easy online reservations. Visit miamidade.gov/parks/winter_camps.asp for more information. Help bring Holiday joy to a family in need. Drop off an unwrapped toy at any Miami-Dade Fire station between now and Christmas day. For more information, call 305-519-8553. On the agenda is a resolution revoking a pre-incorporation resolution that allowed an alternative school for at risk teens (Bay Point Schools) to operate at a facility located just east of Centennial Middle School at 22025 SW 87th Ave. Please read the letter from former Cutler Bay resident and Community Council member Nancy McCue explaining why it is important that residents attend Wednesday's meeting. December 9th, from 5-9 pm. Billy the Marlin will visit center court with games, prizes and an interactive 3D view of the new ballpark. December 10th, 11am. Sunburst Beauty Pagents “Miss Merry Christmas” for kids. 2Pm – Children's Carousel Ride with Santa. December 17th, 2pm – Kids 12 and under kids Club event with a holiday magic show, games, music, prizes, face painting and more. December 18th from 6-8 pm – Bring your pet to the Sears Wing for a photo with Santa. Leash required. Saturday, December 17th, starting at 7pm. This annual parade takes place along the Bel-Aire Canal in Cutler Bay. Residents can get a good view of the parade from the Marlin Rd bridge (at Bel Aire Drive), or the foot bridge located at Bel Aire Drive and Cutler Ridge Drive (near Cutler Ridge Park). See the map for locations. Saturday, December 17th from 10am to noon. Children of all ages are invited to listen as Santa Claus reads some classic holiday stories next to the Christmas Tree at the Deering Estate's Stone House Ballroom. After story time, children are invited to participate in an arts and crafts activity. Admission is $12 for adults and $7 for children (ages 4-14). For more information, visit deeringestate.org. Saturday, December 17th from 7:30-9:30pm. Kids, bring your parents to meet Santa. Enjoy a holiday meal with your family. Children will receive a holiday plush gift and enjoy making their own holiday ornaments. Admission includes free parking, admission to “Zoo Lights” with unlimited carousel rides, and a classic turkey and ham dinner. Space is limited so reserve your seat today. For more information, visit miamimetrozoo.com. On Sunday, December 18th, from 2-4pm (arrive by 1:30). Take a cruise on the "Pelican Island Skipper", a 45-foot catamaran, as you explore the waters of Biscayne Bay. $35.00 per person. To reserve your space, call 305-235-1668 ext. 233. For more information, visit deeringestate.org. Friday, December 9th, from 3pm - 9pm. Jump A Roos will be donating 50% of admissions to UM-MSU CARD and the Carrie Brazer Center for Autism. Have fun and help out a great cause. Admission is $9.00 for children 2-12, adults are free. Socks and a signed waiver are required. Jump A Roos is located at Southland Mall next to Regal Cinema. Friday, December 2nd at 7pm. Kick off the holiday season with the Deering Estate's Annual Tree Lighting ceremony in the historic Stone House Ballroom. Enjoy live performances by the Yuletide Carolers. Admission is $12 for adults and $7 for children (ages 4-14). For more information, visit deeringestate.org. Saturday, December 3rd, beginning at 8am. Join your friends and neighbors for a 10 mile, police-escorted bike ride through the Town of Cutler Bay. Registration is from 8:00-8:30am., with a "safety rodeo" at 8:30 with free bike helmets for the first 200 riders. The ride for participants 10 years old and up begins at 9am sharp. Younger kids will participate in activities provided by “My Gym”. The ride begins at the new Lakes By The Bay Park, located at 8551 SW 216th St (next to Whigham Elementary). Helmets are required. For more information, phone town hall at 305-234-4262. December 3rd, at 11 am. The Town of Cutler Bay has a new park and as part of their dedication celebration the town will attempt to break the record for the World's longest ribbon -cutting. The Cutting of the 4½ mile ribbon will be followed by a free cookout, games and activities for the whole family. Lakes-By-The-Bay Park will include three baseball/softball fields, two lighted football/soccer fields, restrooms and concession stand, exercise trail and parking area. 49 acres of the park is dedicated to playing fields and other recreational uses. An additional 55 acres is a natural preserve area owned by the Miami-Dade County. The park is located at 8551 SW 216th. Street, beside Whigham Elementary School. For more information call 305-238-4166. See the map for location. Saturday December 3rd at 7:30 pm. This Annual musical event features an array of musical performances for an evening of filled with the sights and sounds of the Christmas season. The concert takes place at the Old Cutler Presbyterian Church, located at 14401 Old Cutler Rd. Call 305-238-8121 or visit ocpc.org for more information. Saturday, November 19th, parade begins at 4pm. This free annual parade at The Falls features Santa Claus, marching bands, vintage cars, costumed characters and so much more. This years grand Marshal is actress Jennifer Stone of the show “Wizards of Waverly Place”. For more information, visit simon.com. November 19th and 20th from 10am-5pm. Featuring handmade arts and crafts, live entertainment, children's activities, Santa and much more. The event takes place at the Miami-Dade Fair Expo, located at 10901 Coral Way. Visit miamiharvest.webs.com for tickets and more information. November 28th , from 7pm to 11:30pm. Join Cutler Bay resident Minerva Vazquez and watch the Season 2 premier of “TLC's “The Next Great Baker. Minerva was selected from 10,000 applicants nationwide to be a contestant and is the only Florida representative. Cheer her on by attending the premiere night event at Central Beer Garden. This is a family oriented event with free admission. Enjoy finger foods, cake samples and enjoy the show. Central Beer Garden is located at 3015 Grand Ave. Coconut Grove. For more information, visit her facebook page at facebook.com/chefmini or see the flyer. Buy a ticket to win a Mercedes-Benz C-Class car. The drawing will be held at noon, Friday, November 18th at Mercedes-Benz of Cutler Bay. Tickets are $100 each and may be tax deductible, 1000 tickets will be sold. Proceeds will go to the Police Officer Assistance Trust (POAT), a non profit organization providing assistance to law enforcement officers and their families in times of crisis or critical need. For more information, contact Officer John McLaughlin at 786-367-6491. Friday, November 18th, 6:30 pm (movie begins at 7pm). Join your friends and neighbors for a showing of the movie “Rango” staring Johnny Depp. Bring your lawn chairs, and blankets. Admission is FREE. Concession food and drinks will be available for purchase with the proceeds benefiting the Cutler Ridge Elementary School PTA. The movie takes place at the Cutler Ridge Elementary School field at Cutler Ridge Park. November 18th, starting at 7:30pm. Parents and kids alike will have a great time watching the antics of Yogi Bear (G) at Pinecrest Gardens family movie night. Admission is $5 per person. Fresh popped popcorn, soft drinks, hot dogs, and other snacks available for purchase. For additional information, visit pinecrestgardens.com. November 17th, from 6pm to 11pm. Visit Zoo Miami's food truck invasion. More than 30 food trucks and a DJ will be on site near the parking lot entrance. For more information, visit miamimetrozoo.com. On November 11th-13th from 9:30am–4:30pm. This 71th annual event includes more then 15,000 plants for sale, live music, antiques and collectibles, old and rare books, and art. Enjoy live music, a farmers green market, lots of food vendors and Kid Way, with face painting, shows, games and Design Fairchild, a design and furniture show celebrating eco-innovation. The event takes place at Fairchild Tropical Garden, located at 10901 Old Cutler Rd. Admission is $25.00 for adult non-members, $18.00 for seniors 65+, and $12.00 for children 6-17. Call 305-667-1651 for additional information, or visit fairchildgarden.org. November 11th - 13th from 11am to 11pm. Try delicious Greek food, wine tastings, traditional Greek dancing and music, along with free rides and games for the kids. The event costs $5 for adults, kids under 12 are free. The fun takes place at St. Andrew Greek Orthodox Church, located at 7901 N. Kendall Drive. Phone 305-595-1342 or visit themiamigreekfestival.com for more information. Saturday, November 12th from 10am - 1pm. Commissioner Lynda Bell in inviting residents to her First Annual Thanksgiving Food giveaway. Volunteers will be distributing free thanksgiving staples to residents in need at South Dade Park, located at 28151 SW 164th Ave. This event is for District 8 residents only, picture ID's with address is required. Food will be distributed only while supplies last so please get their early. For more information, contact commissioners Bell's office at 305-378-6677. November 10th, 6:30pm, at the Cutler Bay Town Center Bldg, 10720 Caribbean Blvd. The public is invited to get information and provide input during this second public input meeting for the Caribbean Blvd Roadway Improvement Project, discussing improvements on Caribbean Blvd from Coral Sea Rd. to SW 87th Ave. View the presentation (17 MB) from the first meeting that was held on October 5th. 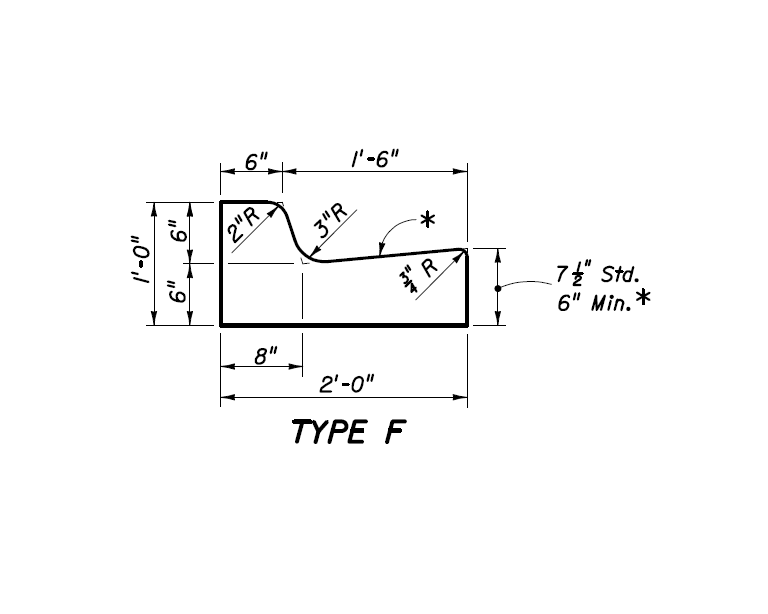 You can also read the questions and responses from the first meeting and see a drawing of the curbing (Type F) that is being proposed for the project. Tuesday, November 8th at 7pm. Find out what that the town has accomplished during the past year and what is in store during the coming year. The State of The Town Address will take place at Mercedes-Benz of Cutler Bay, located at 10701 SW 211th Street. November 5th and 6th, from 9am to 1pm. The Enclave HOA will be hosting a community garage sale. For information, read the flyer or contact 305-552-7855. November 5th from 9am-5pm and 6th from 9am-3pm. The Tropical Audubon Society will hold a native plant sale featuring Rockland & Hammock plants, butterfly and bird attractors and wildflowers. Members only pre-sale day, November 4th from 4:30-6:30 pm. The sale takes place at 5530 Sunset Drive. Visit tropicalaudubon.org for more information. Saturday, November 5th from 8am-5pm. Cutler Ridge United Methodist Church will hold their annual Country Fair featuring hundreds of craft items, a DJ, and free rides for the kids. Enjoy homemade cinnamon buns and other baked goods, a hotdog lunch with potato chips, or for $5.00 try their delicious grilled chicken BBQ including baked beans, corn on the cob, and soda. Cutler Ridge United Methodist Church is located at 20750 Old Cutler Road (map). Saturday, November 5th, 7am check-in, 5K run/walk begins at 8am. Help in the fight against cancer by sponsoring or participating in this event taking place at the Deering Estate. There will be food and beverages at the end, along with live music and a children's area. For more information or to register for the event, visit reasontorun.org. Friday, November 4th, from 8pm to 11pm. Visit Norman Brothers Produce for their annual wine tasting to benefit UM/NSU CARD (Center for Autism and Related Disabilities). Taste wines from around the world, while sampling exotic cheeses, paella, smoked salmon, sushi and more from the Norman Brothers Holiday menu. Cost is $40 per person in advance, and $50 at the door. Norman Brothers is located at 7621 SW 87th Ave.(Galloway Rd). For more information and tickets, call Michelle at 305-284-5269 or email mke@miami.edu. Wednesday, November 2nd from 9:30am to 4:30pm. Enjoy the beauty of Fairchild Garden at a price you can't resist, FREE. Fairchild Tropical Garden is located at 10901 Old Cutler Rd. Call 305-667-1651 for additional information, or visit fairchildgarden.org. Tuesday, November 1st from 6-10pm. Here's an easy way to help support those working to protect our environment. Dine out with The Tropical Audubon Society (TAS) at Whisk Gourmet on November 1st and 10% of your check will be donated to TAS to support conservation efforts. Whisk Gourmet is located at 7382 SW 56th Ave. If you can't make it, you can still help TSA with a donation by visiting auctionpay.com. Beginning October 15th, Zoo Miami is ready to celebrate the Halloween season with Creepy Houses ( October 15th–31st), a Monster Masquerade for ages 21 and over (October 22nd), Teen Fright Night- with food trucks, DJ's and a haunted house for teens (October 27th), Spooky Zoo Nights (October 28th and 29th) and ZooBoo (October 29th and 30th). Find out more by visiting, miamimetrozoo.com or by calling 305-251-0400. October 28th-31st, from 5-10pm. Visit Miami's Seaquarium for their annual Monster Splash Nighttime Bash. There will be kiddie rides and bounce houses, monsters in the Mangrove Haunted Walk, Flipper's Dance Party, Halloween themed animal shows and Sharky's Sweet Tooth Stations. The Miami Seaquarium is located at 4400 Rickenbacker Causeway, Miami. Phone 305-361-5705 for more information, or visit miamiseaquarium.com. Saturday, October 29th, from 6-9pm at Cutler Ridge Park. Experience the terror of the haunted house, the adventure of the spider egg hunt, the costume contest, great food, and don't miss "Track or Treat" taking place around the walking path. Cutler Ridge Park is located 10100 SW 200th St. Call 305-284-4166 for more information. See the flyer for more information. October 29th, starting at 7:30pm. Parents and kids alike will have a great time watching Disney's Spooky Buddies (G) at Pinecrest Gardens family movie night. Admission is $5 per person. Fresh popped popcorn, soft drinks, hot dogs, and other snacks available for purchase. For additional information, visit. Saturday, October 29th, 2-4pm and from 5-7pm. Halloween treats will be available at the fountain area near TJ Maxx from 2 to 4pm (while supplies last). Then from 5 to 7pm, there will be creepy crafts, ghoulish games, tattoos, costume contests, prizes and more for kids 12 and under. October 30th, from 9:30am to 4:30pm. Bring your dog to Fairchild Garden for a day of four-legged fun, including a Howl-o-ween dog fashion show, costume contest with prizes, gourmet hot dog court, demonstrations, canine caricatures and photographs, and more. For more information, visit fairchildgarden.org. October 29th and 30th, 11am to 5pm. Visit Jungle Island for a weekend of chills, thrills and fun for the whole family. Join in the Halloween Costume contest, trick or treats, and spectacular animal shows. Call 305-400-7000 for additional information or visit jungleisland.com. October 22nd and 23rd from 9:30 to 4:30. Visit Fairchild Garden for their Edible Garden Festival featuring talks, workshops and demonstrations on creating a vegetable garden of your own. There will be delicious food, cooking demonstrations, a plant sale and more. In addition, there will be a scarecrow contest. For a schedule of events and information on how to enter the contest, visit fairchildgarden.org. October 22 and 23rd. Clean out the garage and closets, the perfect day to have a garage sale is just weeks away. Encourage your neighbors to join in and make this a street-wide, and town-wide event. No permit from the town is necessary on this weekend. Find a garage sale or advertise yours by visiting yardsaletreasuremap.com. October 21st. Piano Lounge at 8pm, Movie at 9pm. Enjoy an evening of lounge music, movies and refreshments. This month's movie is “Chocolat” (PG 13). Admission is just $5 per person. For more information, visit pinecrest-fl.gov. Pinecrest Gardens is located at 11000 Red Road. Saturday, October 22nd, at 2pm. Teens are invited to a Digital Photography Composition Workshop at the South Dade Regional Library. Monday, October 17th at 7pm. The Palmetto Bay Village Council will hold a zoning hearing regarding a potential new Charter School to be built at Franjo Rd. and SW 180th Street. They are requesting to build a K-12 school with 1400 students on 3 acres of land. Traffic on Franjo Rd. as you approach US- 1 will be impacted if approved. The meeting takes place at the Palmetto Bay Village Hall, at 9705 E. Hibiscus Street. To see the zoning plans, visit palmettobay-fl.gov. Saturday, October 15th, 9am - 5pm. The 35th annual Fall Crafts Festival is back featuring homemade crafts from artists all across the country. Enjoy family-friendly events, music by local bands, a car show, and of course, lots of delicious food. Admission is free. The event takes place at 18455 Franjo Road. See the flyer for more information. Saturday, October 15th from 7-10:30pm. "Taste, Tango and Toast to the Andes" as the The Deering Estate presents fine wines and food at the 10th Annual Wine on Harvest Moon. This event will feature the flavors and rich culture of Argentina and Chile. To purchase tickets or for additional information, visit deeringestate.com or call 305-235-1668 ext 263. Saturday, October 15th from 5:30-8pm. Cutler Ridge United Methodist Church Kindergarten will kick off their 40th anniversary celebration with a Hoedown and Chili Cook-Off. There will be a chili contest, tasting, full chili meal, children's activities, Cowboy/cowgirl costume contest, silent auction, music, line dancing and more. The event takes place at the Church located at 20740 Old Cutler Road (Corner of Marlin and Old Cutler Rd.) Tickets are $8.00 for adults, $4.00 for children 3-11. All proceeds will be used to upgrade the school's playground. For more information, read the flyer. October 15th and 16th, 10am to 6pm. Visit the Miami Science Museum for their annual gem and mineral show. There will be classes, workshops, demos and vendors. Miami Science Museum is located at 3280 South Miami Avenue. For more information, visit their website at miamisci.org or phone 305-646-4200. Saturday, October 15th, from 12:30 to 2:30pm. Visit Center Court at Southland Mall where the Miami- Dade Reading Council will be holding a children's storytelling event in honor of Hispanic Heritage Month. Come pick up a free book and learn more about Hispanic culture. October 14th-16th , 21st-23rd, Fridays 6pm to midnight, Saturdays, noon to midnight and Sundays, noon to 10pm. Join in the fun as the German American Club celebrates Oktoberfest. Enjoy German food, beer, carnival rides, German dance groups and youth entertainment and activities. Register to win 2 tickets to Germany. The event takes place at 11919 SW 56th Street. For details, phone 305-552-5123 or visit the German American Club website. At the September 20th budget hearing, the Town Council voted to lower residents ad-valorem tax rate from the current rate of 2.5888 mils to 2.5702. They did so by making several cuts to the budget. This rate will still allow for the Town to move forward with negotiations to partner with Miami-Dade Public Schools for a Cutler Bay High School. Residents who do not have insurance or who have prescriptions not covered by insurance may get a discount card from Miami-Dade County. The card can be obtained at the County Commissioner's offices or can be downloaded at caremark.com/naco. Information about participating pharmacies can be found by calling 1-877-321-2652. Cutler Bay has been in the national news lately. Read about us in these recent news articles. Sunday, October 9th from 9:30am - 4:30pm. Visit Fairchild Tropical Garden for their 3rd annual Bird Day. There will be talks and lectures, bird walks, and for the kids crafts, games and much more. For the schedule of events, pricing information and more information, visit fairchildgarden.org. October 5th, 6:30 pm. Public Input meeting for the Caribbean Blvd. Roadway Improvement Project. Back in 2007, PTP (People's Transportation Trust) money was allocated to 2 roadway improvement projects in Cutler Bay, Caribbean Blvd and Old Cutler Rd. Improvements for Caribbean Blvd are expected between Coral Sea Rd. and 87th Ave. and include a traffic circle, bike paths, turn lanes, and landscaping. The meeting takes place in the Town Hall Chambers, located at 10720 Caribbean Blvd. 7pm Tuesday, October 4th, at the Community Center in Cutler Ridge Park. Find out the rules and regulations of political campaigning at this public seminar sponsored by the Concerned Citizens of Cutler Bay. For more information, read the flyer or call Fred Ambrose at 786-252-2798. Wednesday, October 5th, Fairchild Garden is offering free admissions on the first Wednesday of every month, until November. Enjoy complimentary tram rides and yoga classes while enjoying the beautiful garden-all for free. For more information, visit fairchildgarden.org. Saturday, October 1st at 8pm and Sunday October 2nd at 3pm. The grand opening performances include a variety of music, dance artistic presentations. For more information, visit the Miami-Dade Cultural Affairs website. Wear something pink on October 1 and 2nd and enjoy $10.00 admission to Zoo Miami. Visit the Zoo's website to find out more at miamimetrozoo.com. Saturday October 1st from 7pm-11 pm. The Rotary Club will host it's 8th Annual Casino Night Mardi Gras Masquerade at the Palmetto Bay Village Center 3rd floor. Enjoy appetizers, an open bar, live and silent auctions, raffles, and door prizes all while experiencing the excitement of casino gaming. Prizes include vacation trips, hotel stays, dinners, sports memorabilia and more. Money raised goes to provide college scholarships for students in our local community. Tickets are $50 each. Palmetto Bay Village Center is located at SW 184th St. and Old Cutler Road. Proceeds benefit the Perrine Cutler Ridge Rotary Foundation. For additional information or to purchase tickets, visit pcrprotary.org, or call 305-897-6827. Looking to buy a new refrigerator or clothes washer? Rebates will soon be available to Miami-Dade residents through a federal grant. Rebates on new Energy Star refrigerators are $200, and $150 on clothes washers. Applicants must pre-register and receive an registration number. Participants can pre-register online or by calling 311 between September 26th and October 10th, or until reservations run out. For complete details including application form, checklist and timelines, visit green.miamidade.gov. September 24th-25th, from 9:30am to 4:30pm. Learn to identify South Florida's butterfly species and the plants that attract them. Take a butterfly walk through the garden with an expert. Enjoy engaging kid activities. For additional information, visit fairchildgarden.org. September 29th, 6pm. Following the release of the 2010 Census, Miami-Dade County is holding a series of meetings to address updating the commission district boundaries. The District 9 meeting with Commissioner Lynda Bell takes place at the South Dade Library, located at 10750 SW 211th Street. For additional information visit, miamidade.gov/redistricting/. School for Advanced Studies (SAS), a full-time, nationally-recognized, dual-enrollment high school, will be holding information/application sessions on Saturday, September 24th for the 2012-2013 school year, at two Miami Dade College (MDC) campuses: Kendall Campus, 11011 S.W. 104th St. at 9:00 a.m. in the Gymnasium; and Homestead Campus, 500 College Terrace, at 1 p.m. in room F222. For more information, read the press release. The Town of Cutler Bay will conduct two public hearings to discuss the town's 2011/2012 budget. The first meeting takes place on Tuesday, September 6th, and the second on Tuesday, September 20th. Both meetings will take place at 7pm in the Council Chambers at Cutler Bay Town Hall, located at 10720 Caribbean Blvd. September 13th, 7pm. The next Town Hall Meeting to discuss options for a Cutler Bay High School will take place at Town Hall, located at 10720 Caribbean Blvd. The Town of Cutler Bay and the Miami-Dade Public School System(MDPS) have entered into discussions about transforming Centennial Middle School into a 6-12 public High School. This opportunity came just a few short weeks after the town conducted its first Town Hall meeting requesting public input about starting a Charter High School in Cutler Bay. 600 new students could be accommodated. Three new academies at Centennial may be added including an International Baccalaureate, iPrep and Environmental Studies programs. This joint venture MAY require a yet to be determined financial commitment from the town. More information will be provided at the next Town Hall Meeting on September 13th, at 7pm. Town Hall is located in the Cutler Bay Town Center Building, at 10720 Caribbean Blvd. Cutler Ridge Soccer invites all Cutler Bay families to join them for their Opening Day Festivities at Cutler Ridge Park from 10am-2pm. Join them for some fun on the field and spend some time with the players and coaches as they open their 2011-2012 season! For more information, visit the Soccer Club's website. September 17th to November 5th, from 9 am to 12 noon. Register now for tennis lessons at Cutler Ridge Park. This 8 week session of classes cost only $120. Class size is limited so register early. For registration or additional information contact the towns parks and recreation dept. at 305-238-4166. September 17th, 6-10pm. The Gold Coast Railroad Museum will be hosting an evening event of BBQ, train rides, and live music. For ticket and other information visit, gcrm.org or phone 305-253-0063 for advance ticket purchase. The Gold Coast Railroad Museum is located at 12450 SW 152nd Street. Saturday, September 17th, from 10am-5pm. The Deering Estate will host their Fee-Free "P.L.A.Y." Days. Enjoy complimentary admission, hands on eco-art activities, science discovery programs and tours- all for free. There will be art exhibits to view and food available for an additional fee. For more information, call 305-235-1668 ext. 233. September 17th and 18th from 9:30am-4:30pm. The plant show and sale features a large display of Aroids with on-site experts to help you in your selection. The Aroid family includes Alocasia, Anthurium, Caladium, Philodendron, spathaphyllum and others. Fairchild Garden is located at 10901 Old Cutler Rd. For additional information, visit fairchildgarden.org. Saturday, September 17th, from 9-3pm at the Deering Estate Visitor Center. Help set TAS' Conservation Agenda in the coming year. Breakfast at 8:30am followed by speakers and Q & A on the following topics: Southern Everglades Restoration, FP&L Land Swap & other Park Concerns, Growth Management, Biscayne Bay Issues, and Bird Conservation. This workshop is free and the public is highly encouraged to attend and participate. For more information, visit tropicalaudubon.org. Whether or not Cutler Bay should have a Charter High School within our boundaries is the question that the Town Council is attempting to answer and they have asked for your input as they continue to explore the possibilities. The town Council held the first of several community town hall meetings on August 18th. Approximately 100 residents attended and viewed a presentation, asked questions and gave their opinions. For the residents who didn't attend the meeting, or for those who want a closer look, we are including links to the PowerPoint presentation from the meeting. In addition, the Council commissioned a feasibility study which we are also making available. Each year, local governments are required to provide to the Property Appraisers Office a MAXIMUM millage rate being considered by the local government. At the July 26th Town Council meeting, the Council voted 4 to 1 to set the town's MAXIMUM tax millage rate at 2.8031. Councilmember Sue Loyzell was the dissenting vote. The current millage rate is 2.588. The final tax rate will be discussed and set at 2 upcoming budget hearings with the final decision due before October 1st. Tuesday, August 23rd, from 6:30 to 8pm. The Town of Cutler bay will hold a community meeting to discuss replacing the existing bridge over the C-1N Canal with a longer and wider bridge. Additional improvements include providing a median, wider sidewalks, bicycle lanes, resurfacing and new pavement marking and signage. The project is under design, with construction to be completed in 2013. Funding for this project comes from the stormwater utility fund. The meeting will take place at the Cutler Bay Council Chambers, located at 10720 Caribbean Blvd. Saturday August 27th, starting at 8pm (gate opens at 7). The Deering Estate hosts its Annual Summer Cabaret Series featuring Karina Iglesias. Guests can bring refreshments and snacks to enjoy during the show. Tickets are $20. To purchase tickets or for more information, call 305-235-1668 ext. 233, or visit deeringestate.org. Fairchild Garden is offering free admissions every Sunday in August, from 9:30am to 4:30pm. Additionally, you can visit for free on the first Wednesday of every month, until November. Enjoy complimentary tram rides and yoga classes while enjoying the beautiful garden. - all for free. Free days in this upcoming month are August 3rd, 7th, 14th, 21st, and 28th. For more information, visit fairchildgarden.org. Saturday, August 20th from 10am - noon. From 10 to 10:30, learn how to start and maintain a compost pile. Then from 11 am to noon find out how to construct and install your own rain barrel. Both workshops are free and include a shower head and light bulb exchange. Participants may purchase a rain barrel for $40 however, you must pre-order the rain barrel prior to the workshop. To RSVP, email Barbara McAdam at bmcadam@ufl.edu or phone 305-248-3311 ext. 245. For additional information and registration form, visit miami-dade.ifas.ufl.edu/environment/natural_resources. Saturday, August 20th from 10am-5pm. The Deering Estate will host their Fee-Free "P.L.A.Y." Days. Enjoy complimentary admission, hands on eco-art activities, science discovery programs and tours- all for free. There will be art exhibits to view and food available for an additional fee. For more information, call 305-235-1668 ext. 233. August 13th and 14th from noon to 5pm. Get information about after school programs, photography, college planning, insurance and health care during the Falls Shopping Center "Back-To-School" splash. This years event will feature a “water carnival” with paddle boats, hamster balls, water slide and a “car wash” bounce house. There will be magic shows, a teddy bear clinic, crafts, giveaways and more. For more information, visit sun-sentinel.com. Florida's back-to-school sales tax holiday will begin at 12:01 am, Friday, August 12, 2011, and end at midnight Sunday, August 14, 2011. During this period, no sales tax will be collected on sales of clothing, footwear, and certain accessories selling for $75 or less, or on certain school supplies selling for $15 or less. For more information, visit http://dor.myflorida.com/dor/. On Saturday, August 13th, from 9am-noon, the Miami-Dade Adopt-A-Tree program will be having a tree give-a-way at the Harris Field Sports complex in Homestead. Participants must bring a valid picture ID. For a list of available trees, a registration form, or for more information, call 305-372-6784, 311, or visit the Adopt-A-Tree website. Harris Field is located at 1034 NE 8th street, in Homestead. Monday, August 15th at 6pm. Representative Dwight Bullard will be hosting an Education Forum to discuss the future of Florida's public education system. Participants are encouraged to ask questions and make comments. The forum takes place at Southridge High School, located at 19355 SW 114th Ave.
August 15th, from 6-8pm. The Town of Cutler Bay has scheduled a workshop to provide information about the Federal Emergency Management Agency's Grant Assistant Program for flood prone homes. The meeting takes place in the Council Chambers at Cutler Bay's Town Hall, located at 10720 Caribbean Blvd. Town Hall Meeting – Do We Want A Charter High School In Cutler Bay? Thursday, August 18th, 7pm, at Cutler Bay Town Hall. Please attend this important community meeting to discuss whether the Town of Cutler Bay should move forward on getting our own Municipal Charter High School. If you want to be a part of the decision making process, it is imperative that you attend this meeting. If you can not attend you can email the council with your questions, concerns or comments. The meeting will take place at Cutler Bay Town Hall, located at 10720 Caribbean Blvd. Have an opinion?, you can leave comments at voicesofcutlerbay.org. August 13th, from 1-3pm. Visit Southland Mall for their Back-to-School Carnival. Kids 12 and under are invited to participate in this event that features jugglers, tattoos, balloons, carnival games and prizes, stilt walkers, and more. The event takes place in the Macy's wing of the mall. Saturday, August 13th, from 10am to 2pm. Visit Southland Mall for free health screenings for the entire family including blood pressure and glucose testing, dental screenings, breast cancer education, bike safety and kids fingerprinting. There will be live entertainment and giveaways. The event takes place at the mall's Center Court. *High School Grades are still listed as pending, and are expected to be released in December, however total points earned for these schools according to the Department of Education as of June 30th and the grading scale is listed below. A=525 points or more, B= 495 to 524, C= 435 to 494, D=395 to 434, F= less then 395 points. Red Light Cameras are being installed and tested in place in Cutler Bay. According to Vice Mayor Ernie Sochin, the only camera currently operating is at US-1, northbound at Caribbean Blvd. Fines will be issued beginning on July 15th. Fines for the other locations will begin by September 30th. For the location of these cameras, fines and additional information, read the announcement. A new homestead exemption is available for military personnel who were deployed last year. If you or a spouse served overseas last year, please visit miamidade.gov/pa/exemptions_military.asp to see if you qualify for this exemption. The June 1st deadline to apply has been extended; applications will be accepted this year only, until September 19th. You can read the press release press release for more information. August 10th, 12:30 to 2pm. Miami-Dade School Board member Dr. Larry Feldman invites parents to meet with him, ask questions, and discuss your concerns. The meeting will take place at Cutler Bay's Town Hall, located at 10720 Caribbean Blvd. July 31st to August 7th from 9am to 5pm. Teens 12 and up can spend a day or a week attending the Illadelph Legends Hip Hop Dance Festival. The week long festival includes Hip Hop dance instruction, workshops, break-out sessions, lecture demonstrations and more. Participants will learn dance from award winning entertainers who have choreographed for the Grammys and movies. Full week registration is available for $500.00, Day passes are available for $100.00. For more information, visit rhpm.org. The South Dade Cultural Center is located at 10950 SW 211th Street, in Cutler Bay. Friday, July 29th, from 9:30am to noon. County Commissioner Lynda Bell and Miami-Dade Transit invites seniors 65 and older to register for the Golden Passport EASY Card that allows access to free public transportation. Registration will take place at Commissioner Bell's office, located at 14707 South Dixie Hwy. Suite 101, in Palmetto Bay. To register, bring your Social Security Card and Valid FL ID or driver's license. For more information, call 786-469-5028. Saturday, July 30th starting at 8pm (gate opens at 7). The Deering Estate hosts its Annual Summer Cabaret Series featuring Graham Wood Drout and Nicole Yarling performing Blues and Americana. Guests can bring refreshments and snacks to enjoy during the show. Tickets are $20, seating is limited. To purchase tickets or for more information, call 305-235-1668 ext. 233, or visit deeringestate.org. The Town of Cutler Bay has voluntarily implemented procedures that will have a positive effect on many Cutler Bay residents' flood insurance premiums. The town's CRS Class rating has been dropped from a “10” to a “6” which will result in lower flood insurance premiums for many of us. If your flood policy shows that you are a “10”, call your company and let them know of the ratings change. If you need additional information, contact Cutler Bay Town Hall at 305- 234-4262. For additional information about the rating system and who is effected, read the notification letter. The Miami-Dade Community Action Agency will be providing free meals to children at numerous sites throughout Miami-Dade County from June 13th through August 12th. All children aged 18 and younger are eligible for meals at no cost. The closest center near Cutler Bay is located at the Perrine Self Help Enrichment Center, 17801 Homestead Ave. Lunch is provided at the site from 11:30am to 1:30pm. For a list of other locations and meals served, visit. Saturday, July 23rd from 10am till noon. Two Environmental workshops are being held at the Deering Estate. From 10am to 10:30, learn how to start and maintain a compost pile. From 11am to noon, learn about water conservation and how to construct and install your own rain barrel. Both workshops are free and include a showerhead and light bulb exchange. You may purchase a rain barrel for $40.00. The Deering Estate is located at 16701 SW 72nd Ave. For registration information, phone 305-248-3311 ext. 242 For additional information, visit miami-dade.ifas.ufl.edu/environment/natural_resources. July 23rd, from 1-3pm. Kids Club Event. Visit the Macy's Wing for an old-fashioned song and dance spectacular. Learn the secrets of recycling. Kids 12 and under are welcome. Saturday, July 9th and Sunday July 10th, from 9:30am-4:30pm. Fairchild Garden presents their International Mango Festival celebrating the "Mangos of Hawaii". The event features tree sales, lectures, fresh fruit and smoothies, an International Fruit Market, and activities for kids. For more information, visit fairchildgarden.org. Saturday, July 16th. The Deering Estate will host their Fee-Free "P.L.A.Y." Days (Preservation, Learning, Adventure, Year-Round). Enjoy complimentary admission, hands on eco-art activities, science discovery programs and tours, all for free. For more information, call 305-235-1668 ext. 233. July, 19th, 6:30pm. The Village of Palmetto Bay will hold a public zoning hearing regarding the expansion of Palmer Trinity. Although the school is not located within the boundaries of Cutler Bay, the expansion will effect our community as traffic to and from the school will be routed through a new entrance located on 184th Street. Palmer Trinity is seeking to increase their enrollment from approximately 600 students and 100 staff members to 1150 students and 250 staff members. The meeting will take place at Christ Fellowship Church, 8900 SW 168th St. For more information, visit palmettobay-fl.gov. On July 2nd – 4th, Zoo Miami will celebrate the grand opening of the Wacky Barn with a Community Hoe Down. There will be barn animals, live country music, givaways, and other surprises. Visit zoomiami.org for more information and a coupon allowing all guests, young and old, to pay the child's admission of $11.95. The Whispering Pines Civic Association, Whispering Pines Woman's Club, and the Town of Cutler Bay will sponsor their 44th annual Fourth of July Celebration in the Whispering Pines Park located at SW88 CT and Ridgeland Drive. (map). A parade featuring decorated floats and bicycles begins at 9:00am (participants must report to the Elementary School parking lot, 18929 S.W.89 Road by 8:15 A.M). Along with patriotic music, there will be a Bounce House, Water Slide, Karate Demonstration, hamburgers, hot dogs, snow-cones, popcorn, a U.S. Air Force flyover (weather permitting), and free watermelon after the parade. The event is free and open to all residents of Cutler Bay and South Dade County. For more information, call 305-235-6709 or 305-235-0561. There will be a July 4th fireworks display at Black Point beginning at 9pm. The fireworks display is presented though the efforts of the Perrine Baseball and Softball Assocoation, Commissioner Lynda Bell, and local municipalities & businesses. For more information, read the flyer. The Town of Cutler Bay will hold a special election on June 28th to fill the remaining term of office for Councilmember, Seat 2. The term of office will end on November, 2012. All registered voters in Cutler Bay will be able to vote, regardless of where your home is located within the town. Get the latest information about the candidates, campaign finance reports, voting records of current council members, a breakdown of sponsored legislation and other information. Visit our elections page at cutlerbay.net/elections-2011. See who contributed to the candidates' campaigns. Reports for the period of June 4th-June 23rd are now available on our elections page. At the Concerned Citizens candidates forum, one question, “Four story buildings on Old Cutler Road, yes or no” clearly set the candidates apart. Mr. Barrentine said “no” and Ms. Loyzelle said “yes”. How would you answer? For a complete listing for other municipalities, visit. June 25th, noon-4pm. Thinking of You Services and the Concerned Citizens of Cutler Bay will be having their annual Picnic for the troops. Admission and food is free. Attendees are asked to bring care package items for the troops. Suggested items are coffee, energy bars, slim jims, disposable razors, and foot care items. There will be entertainment, sports and raffles. The event takes place at the US Coast Guard Station, 16001 SW 117th Ave. (see the flier for instructions to open the gate). RSVP is required. Phone Freddie at 786-252-2798. Saturday, June 25th from 10am to 4pm. Visit the Miami-Dade Fair and Expo Center, Darwin Fuchs Pavillon for a free health fair featuring check-ups for glucose, high bolld pressure, HIV, hemoglobin, cholesterol and more. Free immunizations for children with parental concent and vaccination records. Free mammograms for the first 23 residents. There will be over 70 exhibitors on hand. The Miami-Dade Fair and Expo Center is located at Coral Way and 109th Ave. Phone 305-375-5511 for additional information. June 18th, 11 to 11:45am. Children 6 to 12, Celebrate Father's Day with stories and a craft. Sunday, June 19th, 10am-2:30pm. Treat Dad to a Texas Bar-B-Que Brunch at Fairchild Garden. Enjoy great food and a great setting. For a look at the menu and for cost information, visit fairchildgarden.org. For reservations or more information, call 305-256-8399. Monday, June 13th, at 7pm. All residents of Cutler Bay are invited to attend a Candidate Forum at East Ridge Retirement Center. Both candidates for Cutler Bay District Seat 2, Chuck Barrentine and Sue Ellen Loyzelle have agreed to participate. Find out more about the candidates before you vote. East Ridge Village is located at 19301 SW 87th Ave.
June 9th-12th. Join professional, amateur and junior fishing enthusiasts as they compete for $20,000 in cash and prizes. The weekend event begins on Thursday, June 9th with a Captains Party; the fishing competition takes place on Saturday June 11th with the festivities concluding on Sunday, June 12th with an awards ceremony, food and music. For more information, visit. June 11th, 11am-6pm. The International Hurricane Research Center along with Miami-Dade Emergency Management will present a day of informative speaker, and activities to help you prepare and protect your family and house. Experience hurricane force winds. Admission is free. For more information, visit miamisci.org. June 11th and 12th from 10am-5pm. Visit the Redland Fruit and Spice Park for this annual event showcasing local agriculture, tropical fruits, local wines, foods, and rare fruit samplings. The Park is located at 24801 SW 187 Ave. Admission is $8 for adults, free for children under 11. Phone 305-247-5727 for additional information. June 11th and 12th, from 9:30-4:30pm at Fairchild Tropical Botanical Garden. Visit Fairchild to buy and learn more about bamboo, an ecologically beneficial plant that grows quickly and has a high carbon dioxide absorption rate. Fairchild Garden is located at 10901 Old Cutler Road. Phone 305-667-1651 for additional information or visit fairchildgarden.org for more information. Friday, June 10th, 7:30 pm (movie begins at 8pm). Bring the family for a night of free entertainment featuring the movie "Shrek the Third". Bring your lawn chairs or blankets. Admission is FREE, food and drinks available for purchase. For more information, contact the Town Parks and Recreation Department at 305-238-4166. Thursday, June 9th, from 3pm to 7pm. Children ages 5-17, visit the South Dade Regional Library for a free vision screening. Screenings are available for children with little or no vision insurance. Nothing is required to receive this free screening. Children must be accompanied by a parent. A voucher for free a free-follow up, comprehensive eye exam and eyeglasses, will be provided if needed. For more information, call 305-751-8687. Exams are available on a first come, first serve basis. The South Dade Regional Library is located at 10750 SW 21th St. The US Census Bureau has just released new redistricting data including information on local municipalities. 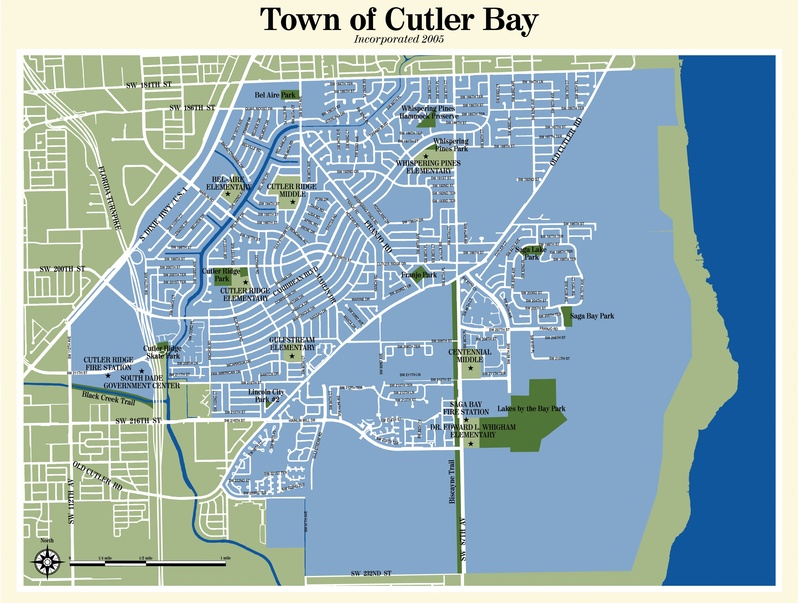 Read the summary page for Cutler Bay and Palmetto Bay, which contains information including population, race, ethicity, housing units, and occupancy. Saturday, June 4th and Sunday June 5th from 9am to 5pm. The Tropical Audubon Society will be having their Native Plant Sale. Create an urban oasis in your own backyard. Experts will be available. The sale takes place at the Doc Thomas House, located at 5530 Sunset Drive. For more information, visit tropicalaudubon.org. For a list of native plants that need less water and are best suited for our community, visit regionalconservation.org. Saturday, June 4th and Sunday, June 5th from 9:30 am to 4:30 pm. This show takes place at Fairchild Tropical Gardens, located at 10901 Old Cutler Road. Phone 305-667-1651 for additional information or visit fairchildgarden.org. Saturday, June 4th, 10am - 3pm. The USDA Subtropical Horticultural Research Station will host their annual Community day. The theme for this years event is "Luscious Lychees". The event is held to inform community members of the research being accomplished at the station. There will be tours of the laboratories and grounds, interactive displays and demonstrations in the areas of horticulture, plant genetics, chemistry and entomology. In addition, there will be food vendors, along with horticultural books, plants and herbs, tote bags and more available for purchase. The event is free. The Research Station is located at 13601 Old Cutler Road. For additional information, call 305-573-7056. May 27th - 29th, 9:30 am to 4:30pm. Visit Fairchild Tropical Botanic Garden for this Annual Show and Sale. Experts and enthusiasts alike will display and discuss this drought tolerant plant. Presented by the South Florida Cactus & Succulent Society. For more information, visit fairchildgarden.org. May 27th and 28th, The Miami Science Museum will hold their first Underwater Festival, which will highlight a selection of prize-winning films. Experience their new hands-on exhibit where visitors will get to touch live stingrays. There will be a photo exhibit, additional touch tanks, experts providing informative talks and more. For more information visit miamisci.org. Beginning in September 2011, Centennial Middle School will begin offering a unique magnet program for incoming 6th graders. The Centennial Ocean Academy of Science & Technology (COAST) program will offer courses emphasizing four aspects of marine and environmental education in South Florida. Applications are now being accepted. An informational meeting is scheduled for Thursday, May 26, 2011 at 6:30pm at the school, where parents and students can apply. For additional information, read the brochure, or call Centennial Middle School at 305-235-1581. Residents of Miami-Dade County will head back to the polls on May 24th to elect a new county Mayor. Eleven candidates have entered the race. Early voting begins on May 9th. The sample ballot, along with early voting information, can be viewed at miamidade.gov/elections. If a run-off election is required, that election will take place on June 28th (the same date as Cutler Bay's special election). Friday, May 20th beginning at 8pm. (gates open at 7pm.). Fairchild Garden will host the romantic movie "Eat, Pray, Love" staring Julia Roberts. Movie treats include popcorn with truffle butter, tortillas cookies, hot dogs, candy, wine and beer. For admission fees and more information, visit their website at fairchildgarden.org. Friday, May 20th and Saturday May 21st, at 8pm. And Sunday May 22nd at 2pm. The Sarasota-based Asolo Repertory Theatre will be presenting the play Las Meninas at the new South Dade Cultural Arts Center. Tickets are $25, $15, and $10, and can be purchased on-line at ticketweb.com or one hour before the performance at the Box Office. The Cultural Arts Center is located at 10950 SW 211th St, in Cutler Bay. For additional information, call 786-573-5300. Sunday, May 22nd, 9am-12pm. US Coast Guard Auxiliary Flotilla 65, Miami South, will reach out to and inform recreational boaters and their kids at Black Point Marina in South Miami-Dade County. The Flotilla will present a safe boating and environmental education display booth at the marina, while Vessel Safety Examiners will conduct free vessel safety checks, and hand out boater safety information for boating adults and their children. For more information, read the press release. Sundays, February - May, 9am-3pm. Locally grown produce prepared foods by local vendors, local arts & crafts, and fun for the whole family. Located at the northwest corner of Old Cutler Rd. and 87th Ave. For more information, read the flyer. May 13th through May 15th, from 9:30am-4:30pm. Fairchild Art instructors and students will showcase more then 150 original paintings. For more information, visit fairchildgarden.org. May 13th through May 15th, from 9am-5pm. Visit the largest annual orchid show in the US with over 50 booths and vendors. Various types of orchids, plants, and supplies are for sale, as well as lectures by experts, raffles, and international food. The event takes place at the Redlands Fruit and Spice Park. Saturday May 14th at 8pm. The acclaimed contemporary dance company from New York will be performing at the new South Dade Cultural Arts Center. Tickets are $25, $15, and $10, and can be purchased on-line at ticketweb.com or one hour before the performance at the Box Office. The Cultural Arts Center is located at 10950 SW 211th St, in Cutler Bay. Sunday, May 15th, 11am – 6pm. A variety of entertainment and food awaits residents as the Cutler Bay Business Association presents the first annual Taste of the Bay. Music, food, arts and crafts displays, a bounce house, and classic car show are all a part of this family-friendly event. Tickets are $5.00 at the gate or free from participating restaurants. The event takes place at the Palmetto Bay Village Center. Visit thetasteofthebay.com for more information. Friday, May 6th beginning at 8pm. (gates open at 7pm.). Fairchild Garden will host the family friendly movie "Legend of the Guardians, The Owls of Ga'Hoole". Movie treats include popcorn with truffle butter, tortillas, cookies, hot dogs, candy, wine and beer. For admission fees and more information, visit fairchildgarden.org. Saturday, May 7th from noon to 10pm. This FREE event includes traditional Mariachi music, folkloric dancers, Tejano music bands and contests including Jalapeno eating, beat the goalie, lasso the torito, and many more. Demonstrations include how to make tortillas, salsa, bunuelos, and how to plat the trompo and how to make pinatas. Tempt your taste buds with delicious Mexican food, fresh vegetables and fruits, and traditional Mexican drinks and pan dulce. For more information, contact Maria Garza at 786-445-8386. The event takes place at Homestead's Historic Downtown District. May 7th and 8th, 9:30 am to 4:30pm. Fairchild Tropical Botanic Garden will be showcasing some of the most beautiful tropical trees, shrubs and vines that grow here in South Florida. Experts will be on hand selling plants and giving advice. For more information, visit fairchildgarden.org. Sunday, May 8th, from 10:30 to 2:30 pm. Treat mom to a Brunch with made to order omelets, delicious pastries and more. $49 for adults plus 18% service charge and Tax. Children 5-12 half price, under 5 free. For reservations, call 305-256-8399. The Afternoon Tea includes scones, savories and deserts while enjoying the music of guitarist Rob Friedman. Tea service begins at 3pm and costs $27 for members, $37 for non-members, and $17 for children 12 and under. For more information and reservations, call 305-663-8059. May 8th, from noon to 4pm. Show Mom how much you appreciate her by treating her to a day of all things chocolate. Enjoy chocolate tastings, chocolate science and a chance to win a chocolate filled basket. For more information, call 305-646-4248. Friday, April 29th and Saturday April 30th, at 8pm – DiaVolo Dance Theater. This award winning, fun for all ages, dance company combines dance with unpredictable, high-flying, acrobatics. Visit www.diavolo.org for more information. Ticket prices are $25, $15, and $10 and can be purchased on-line at www.ticketweb.com. For more information, email Nicolle Ugarriza at nnu@miamidade.gov. The South Miami-Dade Cultural arts Center is located at 10950 SW 211th Street, in Cutler Bay. Saturday, April 30th, from 7-11pm. Visit the zoo for a chance to sample over 100 kinds of beer from around the globe. Live performance by Otis Day & The Knights, The Blues Brothers, and local musician Rosco Martinez. Tickets are $30 pre sale, $40 at the door and $70, VIP admission. Tickets and more information are available at newtimesbrewatthezoo.com. Saturday, April 30th through Sunday, May 1st, from 9:30 am to 4:30 pm. Get tips and recipes during the culinary and gardening demos. Find out how to pick environmentally friendly plants, Visit the farmers market, for fresh fruits, vegetables, herbs, honey, backed goods and more. Kids will enjoy the activities in the Kidsway. Last but not least, take home a plant from the 32nd Annual Spring Plant Sale. For more information, visit fairchildgarden.org. On Tuesday, May 3rd, at 7pm. The Cutler Bay Concerned Citizens is sponsoring a forum for the candidates running for Cutler Bay Council Seat 2. Both candidates have been invited to participate. The event takes place at the Community Room in Cutler Ridge Park, located at 10100 SW 200th St. All area residents are welcome. Registration has begun for the Super Summer Kids Camp at Cutler Ridge United Methodist Kindergarten and Pre-school. This 10 week camp for children ages 2 1/2 to 6 years of age begins June 13th and continues through August 19th. Cost for the camps full day - 5 day a week program is $128. a week. Cost for the 9-12 morning only program is $90. per week. Registration is $80. per child. To reserve your child’s spot, call 305-235-6654 between 7:30am and 5:45pm. For more information, contact Janice Nelson at crumk@bellsouth.net. Friday, April 22nd from 9:30 am - 4:30 pm. Celebrate Earth Day with free admission to Fairchild Garden. There will be kids activities, information about local non-profit environmental organizations, gourmet food for sale, and more. Membership specials include 50% off for new members. April 23rd, 10 am to 5pm. "All Kids Included", A Family Arts Festival for children of all abilities will be the opening event for the South Dade Cultural Arts Center. This years theme is "Dreams Take Flight", celebrating overcoming adversity and following your dreams. This festival will feature live entertainment, interactive art activities, and will include the Diavalo Dance Company (www.diavolo.org) Additionally, there will be the "Amazing Mr. A" magic show, Shadow Interpreted Theatre, storytelling, musical and dance performances, jumping rides, rock wall, Radio Disney, balloon artists, face painting, gourmet food trucks and much more. The Center is located at 10950 SW 211 Street. For more information, phone 305-375-4634 and read the flier. Saturday, April 23rd, 10am. Kids 9 and under are invited join the fun of hunting for eggs, including special eggs for special prizes. There will be snow cones, a bounce house, super slide and balloons. There will even be a DJ and for the first 100 children, a framed 4x6 picture with the Easter Bunny himself. Cutler Ridge park is located at10100 SW 200th Street. Saturday, April 23rd, at 7pm. Celebrate Earth Day this weekend as the Tropical Audubon Society presents a concert featuring "Solar Dogs" a four-piece, acoustic string band specializing in Americana, Bluegrass, Blues and Country Western music. A $10 donation is requested for adults, children are free. The event takes place at 5520 Sunset Dr. Limited parking on the grounds. Metered parking available on Sunset drive. Proceeds benefit improvements to the grounds and historic buildings. April 23rd and 24th, from 11 am - 4 pm. Kids 12 and under will enjoy visiting Zoo Miami for a day filled with continuous egg safaris, activities and the Easter Bunny. April 24th, from 10:30 to 2:30 pm. Come celebrate Easter and the magic of springtime in the garden. Brunch includes an omelet station, waffles, salads, carving station and desserts galore. $40.00 for adults (plus an additional 18% service charge and 7% tax) Children 5-12 half price. Free for under age 5. For reservations, call 305-256-8399. visit fairchildgarden.org for full menu and more information. Saturday, April 16th,at noon. See the improvements to the park, including a lighted tennis court, covered playground area, restrooms, and parking. There will be a free cookout along with activities and games. For more information, call 305-238-4166. Saga Bay Park is located at 7900 SW 205th St. (map). Saturday, April 16th, from 9am to 12 noon. (Registration deadline is April 1st). Be a part of helping to clean up Biscayne Bay. Nearby clean up sites include the Deering Estate, Palmetto Bay Village Center and Black Point Marina. For more information, call 305-372-6784 or visit miamidade.gov/derm/baynanza.asp. The South Miami-Dade Cultural Arts Center is seeking volunteers to assist with ushering, ticket taking, information dissemination and various other assignments during the Inaugural 2011/12 Season. The South Miami-Dade Cultural Arts Center will hold two volunteer orientations on April 14th at the South Miami-Dade Cultural Arts Center , 10950 S.W. 211 Street, Cutler Bay , FL 33189. Community members interested in volunteering are invited to attend this orientation to find out more about the South Miami-Dade Cultural Arts Center and volunteer opportunities! Take a tour of the facility, meet the professional management staff, and sign up to volunteer! To register for one of the sessions, please call Daphne Webb, Theater Operations Manager, at 786-573-5316 or email daphnew@miamidade.gov. For more information, read the press release. Friday, April 8th, starting at 8pm. Head to Cutler Ridge Park for a free showing of the Disney movie, "Tangled". This outdoor event is a fun-filled way to enjoy a family movie. Bring your lawn chairs and blankets. Popcorn, candy, sodas, and water will be available for purchase with proceeds benefiting the Cutler Ridge Elementary School PTA. For additional information, call 305-238-4166. April 9th, from 9am-3pm at Mercedes-Benz of Cutler Bay, located at 10701 SW 211th St. Proceeds from the car wash go to the Police Officer Assistance Trust (POAT) to benefit the families of MDPD officers Roger Castillo and Amanda Haworth. Mayor Ed MacDougall has informed us that Centennial Middle School is slated to become a 6th through 12th grade Magnet School. Centennial will begin accepting applications for its MAST (Marine Academy) modeled after Key Biscayne MAST program, beginning with the 2011 - 2012 school year. As the program is just now being developed, it appears that the 6th grade will be the first MAST grade and recruiting for that grade will begin immediately. The plan includes attempting to open the 9th grade to the program to begin the high school portion. The program will then continue to expand in the upcoming years as students’ progress to higher grades. There are still many details to be worked out. We will let you know as more information becomes available. The Concerned Citizens of Cutler Bay will hold their monthly meeting on Tuesday, April 5, 2011, at the Jim Shiver Community Center at Cutler Ridge Park, 10100 Cutler Ridge Drive, from 7-9pm. The guest speaker will be Dr. Larry Feldman, the vice-chairman of the Miami-Dade County School Board. April 2nd and 3rd from 10am-5pm. Find great ideas for transforming your backyard into a tropical paradise. This event features plants, workshops and lectures, garden structures, children's garden station, lady bug release, and food. Cost for the event is $5.00, children 12 and under are free. For more information, visit pinecrestgardens.com. Pinecrest Gardens is located at 11000 Red Road. Wednesday, March 30th, 7pm. The town Council will hold a special meeting to discuss holding an election, and a qualifying period, for the position of Vice Mayor and District Council Seat 2. Sunday, March 27th from 11am-6pm. Savor delectable seafood and enjoy the music at the Deering Estate's Seafood Festival on the Bay. This event features food, entertainment, scenic boat rides, celebrity cooking demonstrations, and a Kids Zone. Cost is $20 for adults ($15 if purchased in advance on-line) and $5.00 for Children ages 4-14. The event takes place at the Deering Estate, located at 16701 SW 72nd Ave. For more information, call 305-235-1668 ext. 266, or visit deeringestate.org. Tuesday, March 22nd from 6-9 pm. Commissioners Lynda Bell and Dennis Moss will be holding a community forum on "The State of Youth in Miami-Dade County". The forum will take place at Sweet Home Missionary Baptist Church, located at 10701 SW 184th Street. For more information, read the flyer. Thursday, March 24th, 5pm to 7pm. Miami-Dade Transit will hold an informational meeting regarding the Americans with Disabilities Act Pedestrian Improvements Project at the Miami-Dade Public Library in Pinecrest. The purpose of the project is to provide access to the Miami-Dade Transit South Dade Busway by adding pedestrian ramps, croswalks and sidewalks, where necessary. The library is located at 5835 SW 111 St. Pinecrest. For more information visit miamidade.gov. Saturday, March 26th from 11am to 1pm. The Concerned Citizens of Cutler Bay, along with MDCPS personnel and Aum HomeShala Yoga School will be presenting a FREE workshop for parents and students in grades 1-12. Come learn techniques on to making it through the FCATs with less stress. The workshop will take place at Cutler Ridge Park, located at 10100 SW 200th Street. For more information call Fred at 786-252-2798 or read the flyer. On Saturday, March 26th from 8:30pm to 9:30pm, join millions of people across the world as they turn off their lights for one hour to raise awareness about climate change. This years theme, "It's time to go beyond the hour" encourages people to commit to actions that go beyond the hour. For more information, visit earthhour.org. Many people use space heaters during the cold weather months to keep warm. Unfortunately, space heaters, when used improperly, can cause fires. Don't put yourself and your family at risk. Before using any space heater, read the instructions that came with the unit. In addition, read these informational guides at heatersafety.org and cpsc.gov. Saturday, March 19th from 10am to 4pm. Visit the Miami Science Museum for an oportunity to learn more about the brain and how it works. Guest speakers will talk on a variety of issues including Alzheimer's disease, brain injury, sleep disorders and autism. Activities include building a neuron, brain puzzles, face painting, puppet shows and a free bike helmet give away. For more information, visit miamisci.org. The Miami Science Museum is located at 3280 S. Miami Ave. The Certificate of Use Ordinance presented last month as a walk on ordinance has created an uproar throughout the community and is not expected to be on the March agenda. For more information, read this community newspaper article. A Cutler Bay resident has suggested that residents be allowed to keep chickens in our backyards to enjoy fresh eggs. The resident has researched the proposal and presented it to the Mayor, who has passed it along to the council. This idea will be presented to the council at the March 16th town council meeting. Click here to read the information package. Miami-Dade County Commissioners set March 15th as the day voters will head to the polls to decide the fate of County Mayor Carlos Alvarez. A petition drive to remove Mayor Alvarez along with county commissioner Sejas will be the only items allowed on the March 15th ballot. Therefore, there will not be an election in Cutler Bay to fill the two recently appointed positions of Vice Mayor and District Two. The March 15th election date is during spring break for Miami-Dade school children. Residents wishing to vote in this election are encouraged to participate in early voting which will take place from February 28th through March 13th, or to vote by absentee ballot. On Friday, March 11th - Sunday, March 13th, from 9:30am - 4:30pm. This event features more than 10,00 orchids from 50 vendors, walking tours, workshops, great food and entertainment. Fairchild Gardens is located at 10901 Old Cutler Road. For more information, visit fairchildgarden.org. Saturday, March 12th, from 8am-2pm. The Cutler Ridge United Methodist Church will hold an indoor Flea Market. Early morning coffee and a hot dog lunch will be available. The church is located at 20740 Old Cutler Road. For more information, please call 305-235-6651 or 305-235-0561. March 5th and 6th from 10am-6pm. Celebrating its 21 year, this annual festival features Asian crafts, art, exotic music and dance, as well as authentic Far Eastern cuisine. Admission is $10, children under 11 are free. The Redland Fruit and Spice Park is located at 24801 SW 187th Ave., in Homestead. Sunday, March 6th, from 11am-5pm. Join our neighbor to the north as they celebrate the 9th annual "Taste of Pinecrest" at Pinecrest Gardens, located at 11000 SW 57th Ave. This event features art exhibits, music, rides and activities for the kids, and of course food from local restaurants. All proceeds benefit Pinecrest's local schools. Admission is free. For additional information, visit pinecrestbusiness.com or phone Amy Simons at 305-662-8024. Sundays at 1:30 pm throughout February. Visit Fairchild Garden on Sundays as they host a series of concerts featuring musicians from the Univesrsity of Miami's Frost School of Music. For more information, visit fairchildgarden.org. Saturday, February 26th at Cutler Ridge Elementary School baketball courts. Check-in 9:30-10am, clinic is from 10am-1:30pm. For more information, visit cutlerridgeumc.org. Saturday, February 26th from 1:30 to 3:30 pm. Visit Fairchild Garden where high school students will show off their innovative research projects regarding green roof/green wall, green cuisine, solar inventions and freshwater restoration ecology. Visit fairchildgarden.org for more information. Tuesday, March 1st, 7pm. The Concerned Citizens of Cutler Bay will be hosting their monthly round-table discussion at Cutler Ridge Park. This months speakers include recently appointed Seat 2 council member Sue Loyzelle along with Allen Thompson, an advocate for “Fair Taxation”, a group proposing an alternative to the Federal Income Tax. Cutler Ridge Park is located at 10100 Cutler Ridge Drive. Saturday, February 19th, from 11am-3pm at Cutler Ridge Park. Join your friends and neighbors to celebrate Cutler Bay's 5th anniversary. Enjoy free food, entertainment, rides, games, and more. Cutler Ridge Park is located at 10100 SW 200th St.(map). For more information, call 305-238-4166. February 19-21st, from 10am-6pm. Enjoy one of the nation's premier outdoor Fine Arts Festival. Visitors enjoy beautiful art work, fine cuisine and live entertainment. The fair takes place in Coconut Grove along the streets of McFarlane Road, South Bayshore Dr. and Pan American Drive. Round-trip shuttle service runs every 15 minutes from the Douglas Road Metrorail station. For more information, visit coconutgroveartsfest.com. Admission is $10 per person per day. Children 12 and under and Metrorail Golden Passport and Patriot Passport holders are free. Emails are being circulated around town encouraging residents to contact the town council and ask them to step up their efforts to bring a Charter High School to Cutler Bay. The town's Charter School advisory committee has been studying the issue for the past year and has made considerable progress. It's now time to take the next step and get the council, town staff and attornies involved in negotiations with the school board, charter school representatives, and other parties. Having our own High School will improve the future education of our children. It will also improve property values, and increase the desirability of our community for both residents and businesses alike. (Southridge High School received a “D” grade from the State for the 2009/2010 school year, up from an “F” the previous year). If we want a high school in Cutler Bay, the council members must make it a priority. If you agree, either send an email to each of the five council members (see below), or better yet, come with your kids to the next town council meeting - February 16th, 7pm. - at the South Dade Regional Library and let them know. Public comments are heard at both the beginning and end of each meeting. February 4th through the 14th. This two-week series of events celebrate the literary, performing and visual arts in our community. To find out more about the different events, including ticketing information visit, deeringestate.org for additional information. February 11th , from 7-10 pm. Come to the Redland Fruit and Spice Park for a family fun night under the stars. There will be moonlight guided tours, and a campfire. Bring your own marshmallows or snacks or purchase items in the Park Store. Southern Cross Astros will have equipment to provide viewings of the First Quarter moon, Jupiter, Uranus, and other winter star clusters and constellations. For additional details, call the park at 305-247-5727. The Fruit and Spice Park is located at 24801 SW 187th Ave., in Homestead. On Monday, February 14th, visit the Deering Estate for a romantic concert under the stars on the edge of Biscayne Bay. The concert features Victor Espinola, multi-instrumentalist and singer. The gate opens at 7pm and the concert begins at 8pm. Cost is $20. Guests can bring blankets, lawn chairs, & picnic baskets. Limited refreshments will be available for an additional fee. For more information, call 305-235-1668 ext. 233. or visit deeringestate.com. February 18th from 6:30 to 8:00pm. Visit Bill Sadowski Park and Nature Center as naturalists walk the trails after dark in search of nocturnal creatures. After the walk, relax by the campfire. Reservations are recommended. Phone 305-255-4767 for reservations and additional information. January 29th, at 8:30am. The Perrine Baseball-Softball Association annual parade starts at Whispering Pines Elementary and ends at Franjo Park. For more information, visit. Saturday, January 29th, 10am to 3pm.. According to Chris Himmel of the Miami-Dade Mayors Office, a fundraiser will be held at Franjo Park for the son of fallen Miami-Dade County Police Department Officer Amanda Haworth. The fundraiser will take place as part of the Perrine Baseball Association's Family Fun Day. Additionally, donations can be made by checks payable to the Dade County PBA love fund, with the names of officers Haworth and Castillo written in the memo section and mailed to 10680 NW 25th Street, Miami Florida, 33172. Sunday, January 30th, 2-5pm. High school students, singers, dancers, musicians and performers compete for cash prizes. This event takes place at Ludovici Park, located at 17641 Old Cutler Road in Palmetto Bay. For more information visit palmettobay-fl.gov or call 305-234-6383. Tuesday, February 1st, 7pm. Join the Concerned Citizens at their first meeting of the New Year, which will be held in the Community room at Cutler Ridge Park. This meeting will take the form of a meet and greet. New members from throughout Cutler Bay are welcome to join. The Concerned Citizens provides one of the few venues where residents can listen to and ask questions of guest speakers in an informal round table setting. Friday, January 21st through Sunday, January 23rd, from 9:30am until 4:30pm.. Visit Fairchild Garden for their 5th Annual International Chocolate Festival. This event will feature chocolate treats, along with coffee and tea. Enjoy cooking demonstrations, informative lectures, and tree sales. The event takes place at Fairchild Tropical Gardenn located at 10901 Old Cutler Rd. For more information, visit fairchildgarden.org or call 305-667-1651 ext. 3344. Friday, January 28th at 8pm. Saturday, January 29th, at 2pm. and Sunday January 30th, at 2pm. This annual event takes place at the Doc DeMilly rodeo Arena at Harris Field located at US-1 and Campbell Dr., Homestead. Tickets are $15.00 at the gate for adults, and $5.00 for children. Free Rodeo Parade on Saturday, January 29th, at 11am in downtown Homestead. For additional information, visit homesteadrodeo.comor phone 305-247-3515. Opening January 22nd. Visit Zoo Miami and get "The Scoop On Poop". This unique traveling exhibition takes a scientific yet fun look at what poop is and how it is used. For more information visit, miamimetrozoo.com. Beginning Thursday, January 27th, at 8pm. This first concert of three features Peter Betan, instrumental guitarist, singer and songwriter whose music includes acoustic pop with elements of jazz and folk music. Gates open at 7pm. Arrive early for preferred seating. Bring along your own refreshments to enjoy during the show. Single tickets are $20 or purchase tickets for the three-concert series for $55. The event takes place at the Deering estate. For more information visit, deeringestate.org or phone 305-235-1668, ext. 233. Saturday, January 22nd, from 1-3pm. Visit center court where children 12 and under will join Safari Sam and Jungle Jenny as they use the power of imagination to take kids on a fun-filled adventure through the African jungle. This, nonstop song and dance spectacular is Free. Saturday, January 15th. Starting time is at 9am with the event ending at 5pm. An event for car enthusiasts, history buffs and those who enjoys a leisurely drive through rural South Miami-Dade County. Participants start at Cauley Square, located at US-1 and 224 Street where they receive a map, driving directions, and a series of questions to be answered along the way. The event moves on to other Homestead destinations The cost is $5.00 per team in advance and $10.00 at the event.. For more information and to preregister, visit redlandriot.com. Saturday, January 15th and Sunday January 16th from 10am-5pm. Visit Pinecrest Gardens for their fine arts festival featuring nationally recognized artists. Enjoy music and entertainment, food and drinks. Admission is FREE. Pinecrest Gardens is located at 11000 Red Road, in Pinecrest. For more information, visit or phone 305-284-0900. January 15th and 16th, from 10am-5pm. Visit the Redland Fruit and Spice Park for this annual festival featuring historic displays, arts and crafts, tropical plants, and food. Children't activities include pony rides, puppet and magic show, everglades reptile show and a petting zoo. Admission is $8.00 for adults, $2.00 for children ages 6-11. Redland Fruit and Spice Park is located at 24801 S.W. 187th Avenue, in Homestead. Phone 305-247-5727 for more information. Residents of the town may be getting a scaled down version of the much anticipated improvements scheduled for Old Cutler road. At the very least, improvements will not begin this month as planned. Town manager, Steve Alexander, informed the town council on November 15th, that wording in the agreement between the town and the county contains language that is subject to interpretation. The county alleges that the contract does not allow for "enhancements" that the town assumed were acceptable. Some of these enhancements include: brick pavers, trees, and coral rock walls. See the renderings of the roadway with and without these improvements. In addition, the manager stated that the county was responsible for purchasing the land needed for to construct the traffic circle at 87th Ave.. Despite a December timetable to begin construction, he was not aware that the land had not been purchased, nor that negotiations have not even begun with the owner. This will of course, significantly delay that portion of the project. Apparently, Mr. Alexander informed outgoing Mayor Paul Vrooman of the issues in mid October, along with outgoing commissioner Katy Sorenson. The full council was not informed of these developments until November 15th, approximately one month after the manager determined there was a problem. December 27th through January 7th. You can recycle your Christmas tree by taking it to the Eureka Drive Transfer Station. Before recycling, remove all decorations including tinsel. Recycled Christmas tree chips will be available at the Eureka Drive station in mid January. Eureka Drive Trash and Recycling Center is located at 9401 SW 184 St. and is open daily from 7am to 5:30pm. Whole trees must be placed at curbside BEFORE Friday, January 7th to be collected. Residents may also dispose of their trees by cutting them into pieces and placing them in their green waste cart. For additional information, visit miamidade.gov/dswm. Saturday, January 8th, from 11am to 3pm. Calling all Chili Lovers!!! Chefs compete to make the best chili, salsa, and cornbread in Cutler Bay. Enjoy the food and the entertainment. The event takes place at Cutler Ridge Park, located at 10100 SW 200th Street. For more information, contact the Cutler Bay Parks and Recreation Department at 305-238-4166.